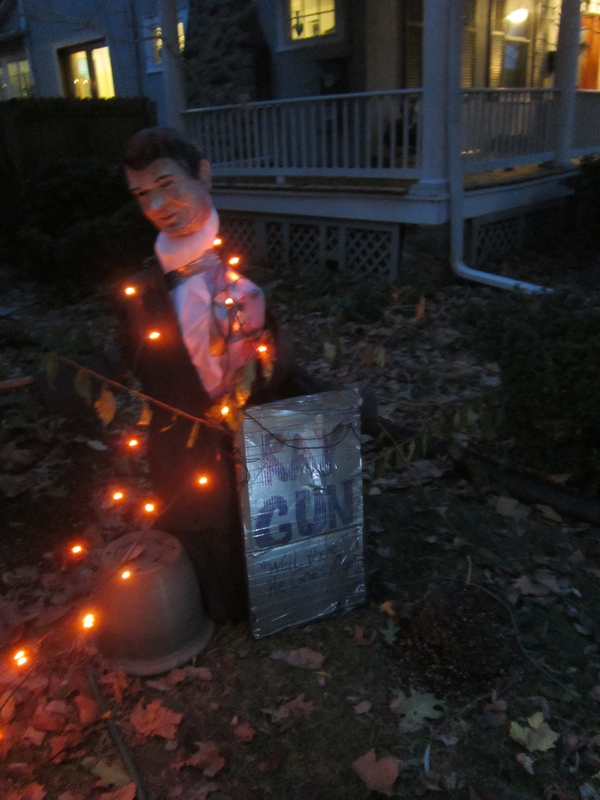 Eleven days after Halloween, this year’s yard display is finally dismantled. 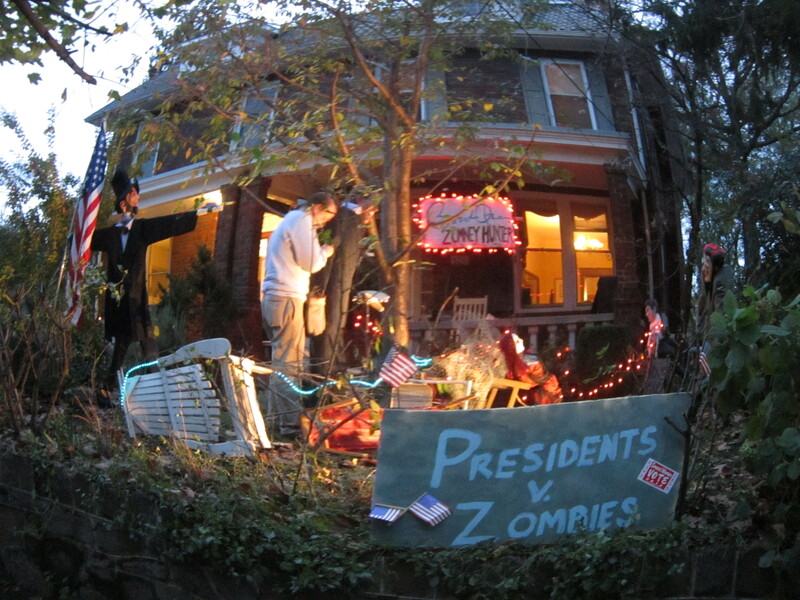 Miraculously, all the Halloween props have been boxed up and some are even put away in the attic. This may sound a bit slow, but since this year’s theme was based on the election, we had to leave it up through Wednesday!. 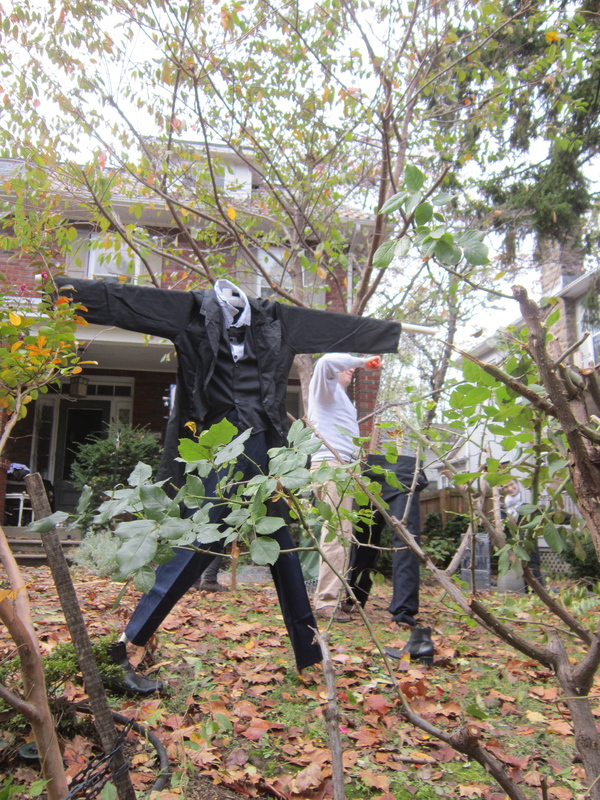 The weather and rain and wind were starting to take their toll on both the zombies and the Presidents, however–poor Abraham Lincoln was losing his head on a routine basis. 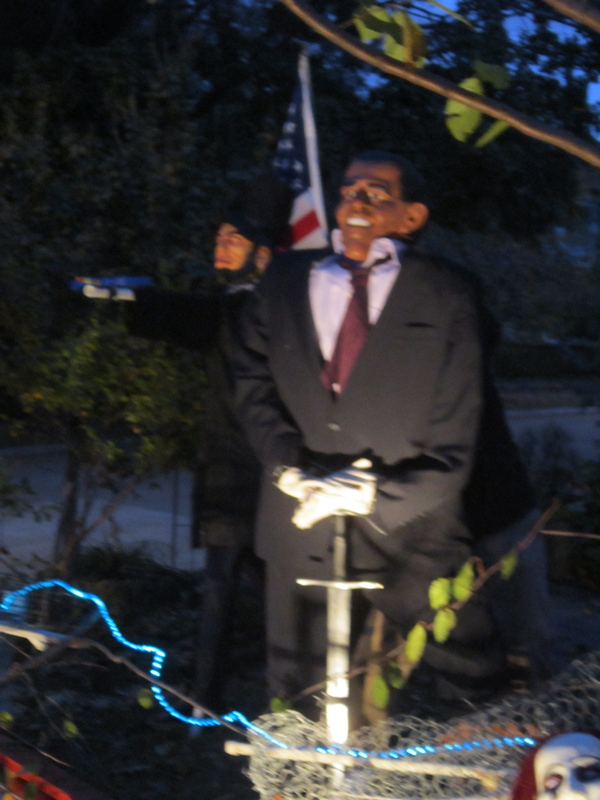 This blog is largely pictoral, but I wanted to pass along a few tips on yard displays. 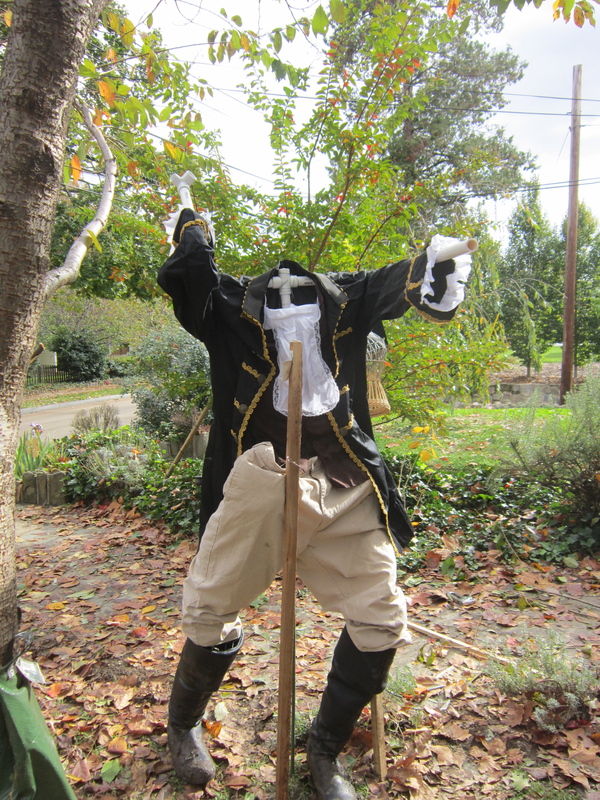 George Washington (sans head) gets his lifelike posture from PVC pipe–and his support from garden stakes. 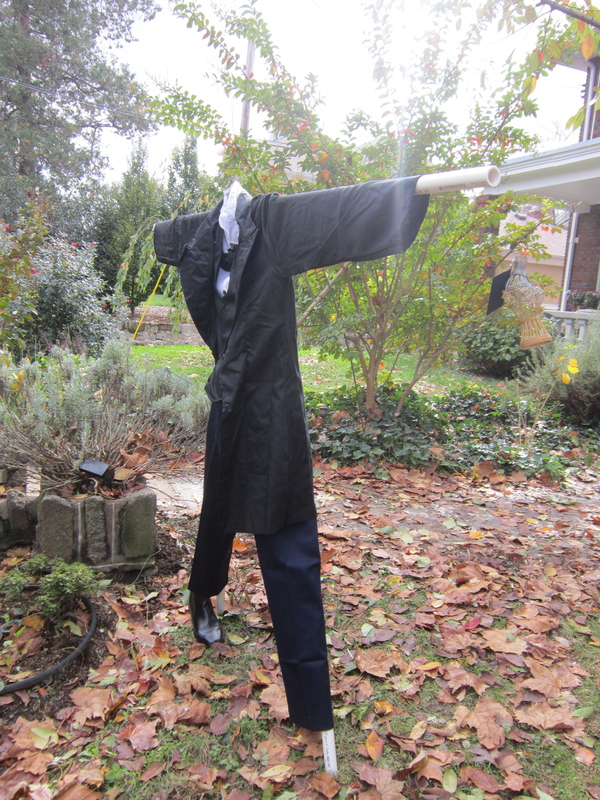 The boots are from the Shakespeare Theater Company annual garage sale. 1. 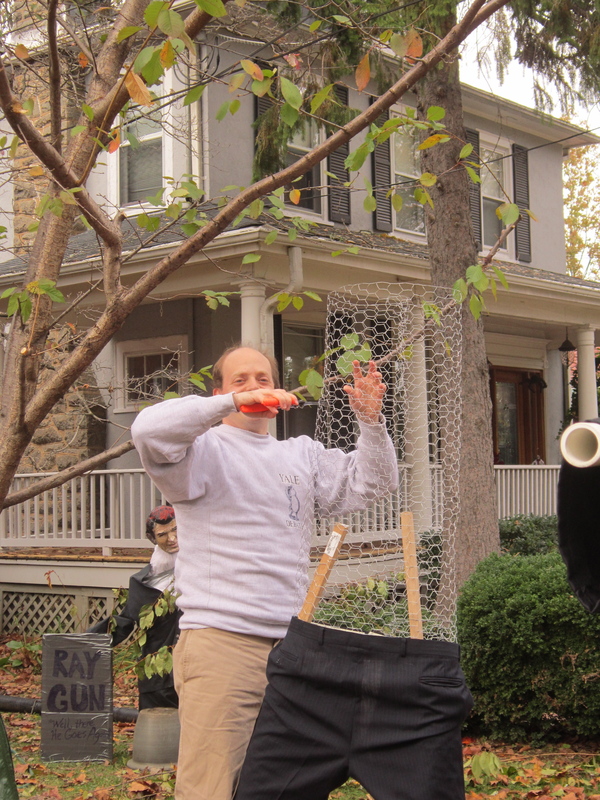 PVC pipe and my devoted husband rule! 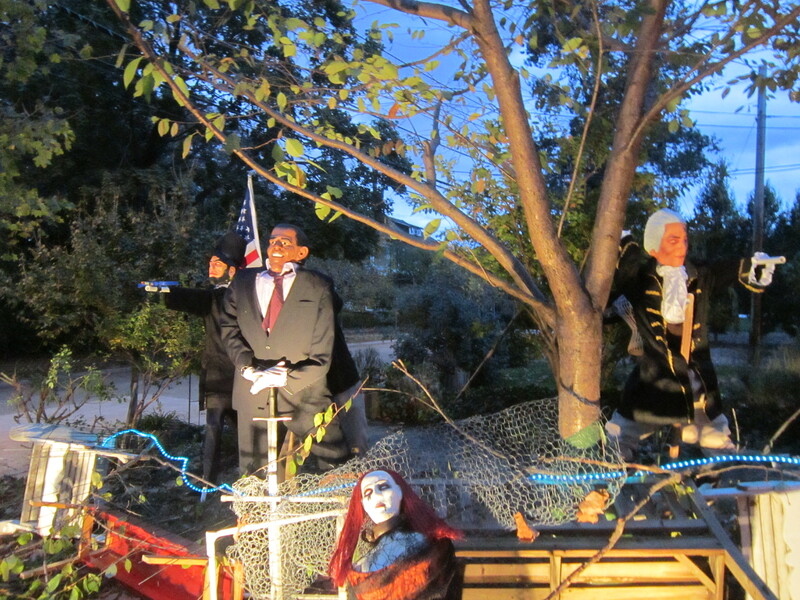 Mike built the “action” figures–Washington and Lincoln with plastic pipe. It took a couple of trips to the hardware store to get all of the right couplings, but the results were well worth it. Here’s the hint: we bought garden stakes that were sturdy but thin enough to fit inside the pipe. This ensured a strong footing for the figures and extra stability. He still wrapped chicken wire around the pipe very lightly (sort of tubes within tubes) to give enough shape for the pants and jackets, but the PVC gave him so much more ability to create lifelike movements. Check out Washington’s throwing arm. 2. 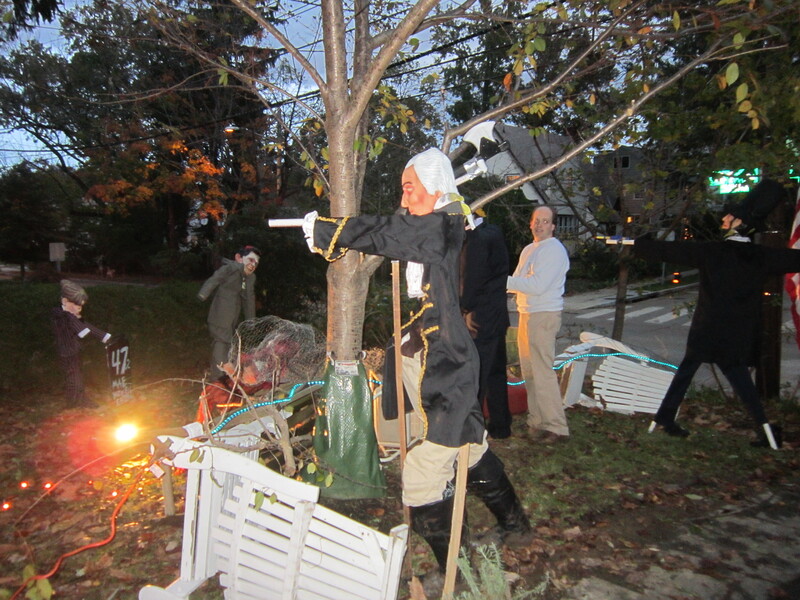 Tree branches don’t make great arms. 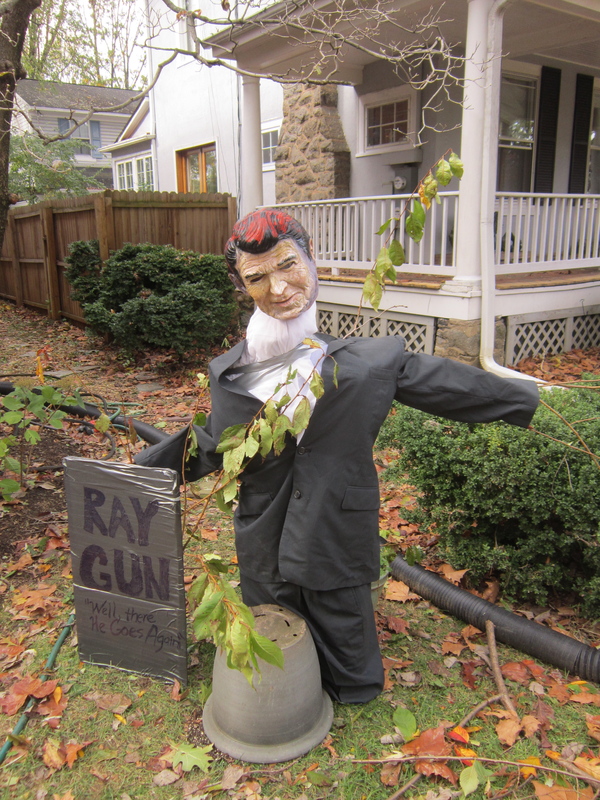 See Ray Gun’s droopy jacket–I ducktaped a big old tree branch across his back. For a zombie, I guess, the kind of falling apart look worked, but not sure I would try that again! 3. 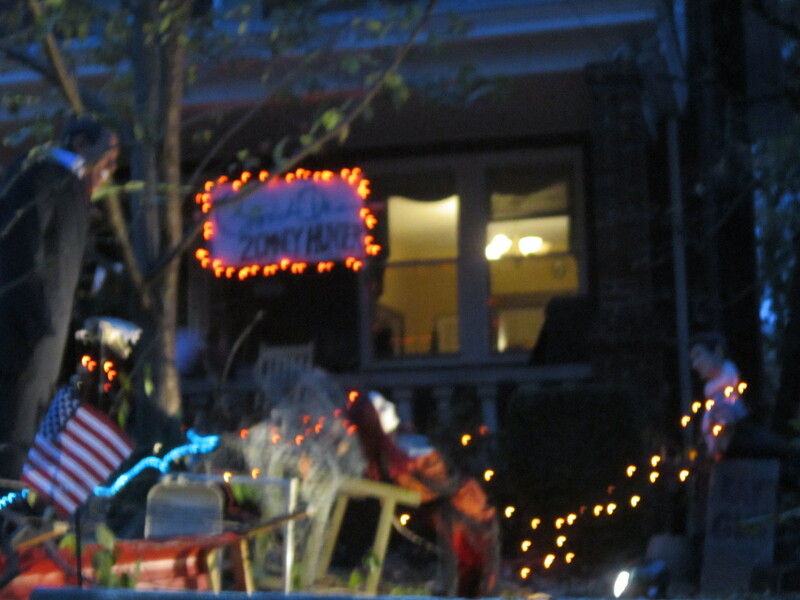 Can’t do without lighting: my flicker lights from Grandin Road. I have three sets acquired over the years–they look like real candle flames and are super sturdy and bright. 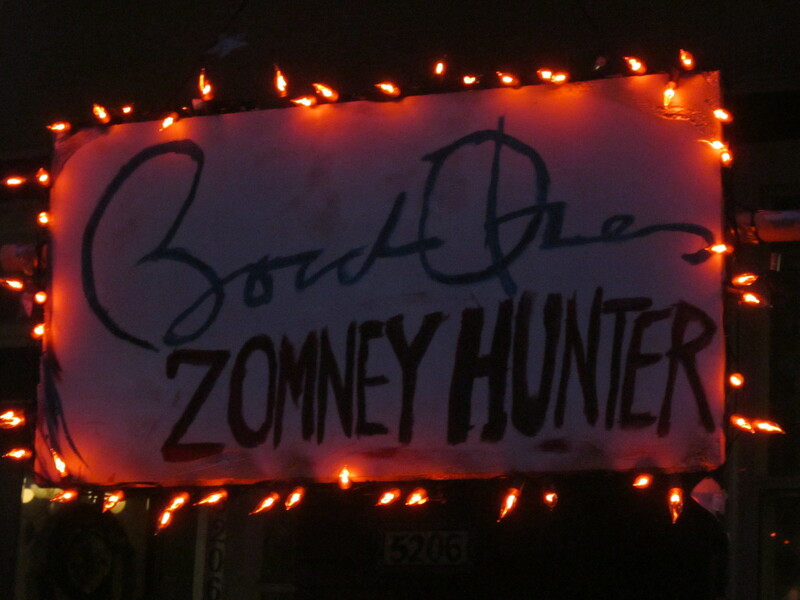 This year they provided the marquis lighting for the “Barack Obama–Zomney Hunter” sign, but I’ve wrapped them around an old chandelier in the past to create mood lighting. 4. Thick foam insulation is another can’t do without product–it makes great tombstones and signs. It is thick enough that you can stick some small garden stakes into the bottom to create sturdy tombstones and it absorbs color beautifully. 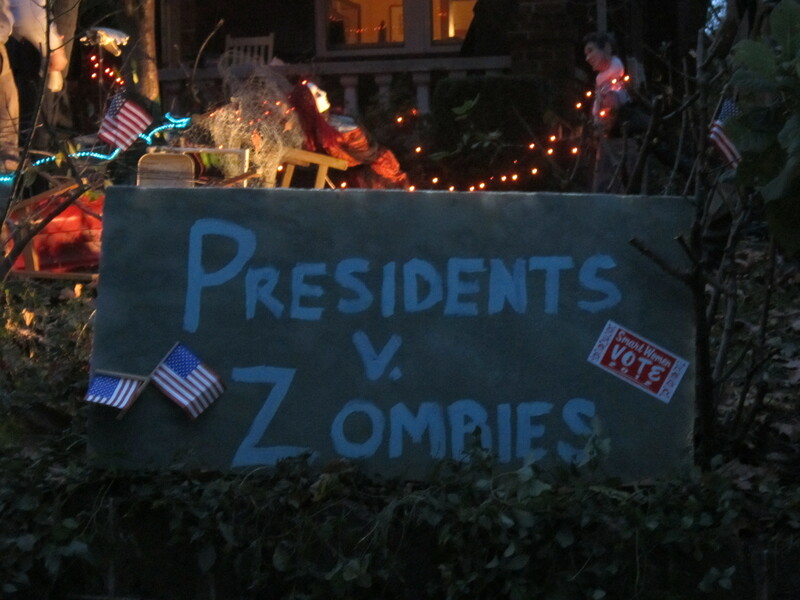 Hard to believe that both the Presidents v. Zombies sign and the Barack Obama sign started life as pink,huh? I use to buy big canvasses at the art store for signs, but the foam core insulation is a better and cheaper choice. Anyway–enjoy the pictures and feel free to ask how we made this all happen.